Temperature and relative humidity data loggers are used to monitor bat swarming sites including Dover Castle. Seasonal temperature and relative humidity changes are being recorded as part of research into bat swarming behaviour. Bat lovers in the Dover area are very lucky to have an abundance of underground workings, and volunteers from the Kent Bat Group monitor as many of these as possible - particularly in winter as part of the Bat Conservation Trust's National Bat Monitoring Programme hibernation counts. Recently, the Group has begun to realise the importance of some of these as autumn bat swarming sites. This activity seems to be about mating but also might have a social function, as young non-breeding bats are often found in the swarms: 'bat festivals' perhaps! 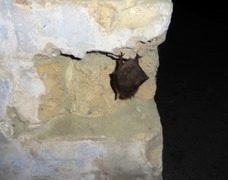 For four years now the Group has been monitoring autumn swarming bats at a Palmerston fort built when the fear of a Napoleonic invasion was at its height. Last year a ringed Natterer's bat, most likely one from the fort, was seen flying in a well in Dover Castle, within a kilometre to the south. It is possible that the same bats were visiting both sites: it is often considered that bats are faithful to one swarming site, but this may not always be the case. Having obtained the appropriate licences from Natural England, members of the Group set about ringing as many bats as they could catch in the swarming area and monitoring their activity. Gemini supplied two Plus 2 TGP-4500 data loggers to monitor temperature and relative humidity at the castle. Recording this information is important because bat swarming behaviour is not well understood and it is vital to have some idea of the environmental conditions that may trigger or delay swarming. These robust, waterproof data loggers are ideally suited to the environmental conditions in the underground area of the castle, and can be left for long periods if required to minimise the impact of human intrusion on the site. Similar monitoring has been carried out at the nearby fort for some time. The data is still being analysed but suggests that swarming takes place during the same time frame each year, but the focus of activity sometimes varies within the fort, possibly depending on meteorological conditions. Temporary light tags were placed on a few Natterer's bats, in the hope it would help determine their destination. It was intended to analyse all the data and manual observations from both sites, however the week planned for this operation was one of the windiest of the season and this was not as successful as hoped, as the bat numbers were lower than expected. The Group hopes for better results in future years, but is now certain that the autumn swarming activity in the area is significant; yet more research is needed, through monitoring of these sites, for several more autumns. Monitor outdoor environmental conditions with a Tinytag Plus 2 temperature and relative humidity data logger.